The "What" and the "Why"
When scientists look at data and graphs, they are trying to find patterns or look for things that don’t fit in with the rest of the data. When they see patterns or things that are “odd,” they try to understand what might have caused the pattern or the changes. These graphs by themselves don’t tell us what caused that change, they just give us a way to look at the data and begin to ask questions. As a scientist, you have to come up with possible explanations that you can test. The graphs below are an example of how you can look at and interpret the data that are collected by the stream data. Take a look at the graphs and explanations below! This graph shows how salinity (measured as conductivity) in the Watts Branch Stream changes over time. 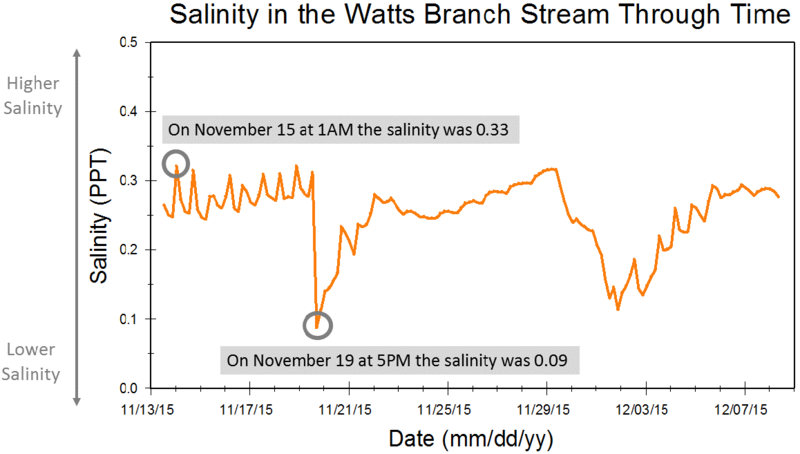 The orange line indicates changes in salinity between November 13 and December 9. The closer the point is to the bottom of the graph, the lower the salinity. A higher point in the graph indicates an increase in salinity. Notice the dip on November 19. Do you have any ideas why the salinity may have dropped so suddenly? One possible explanation for the low salinity on November 19 could be heavy rainfall. First, let’s take a look at another graph. 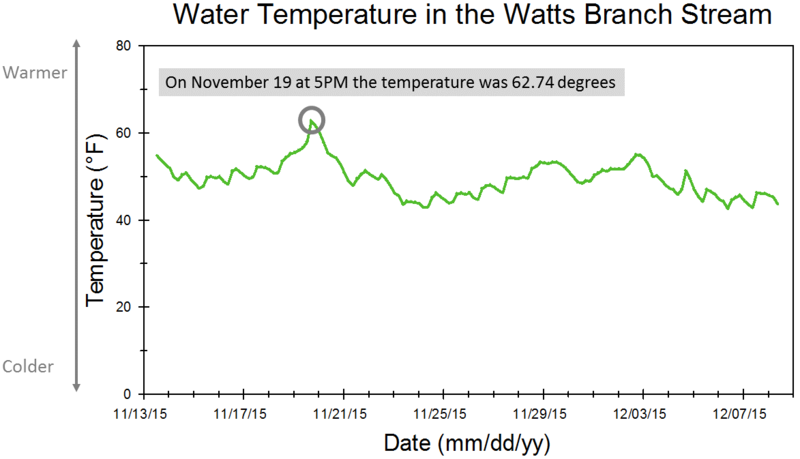 This graph shows changes in the water temperature of the Watts Branch Stream through time. The higher the point, the higher the temperature. The lower the point, the lower the temperature. Notice the peak in temperature on November 19. The water temperature was 62.74 °F! That’s the same point we saw the lowest salinity (0.09 PPT) in the previous graph. This makes sense because temperature and salinity are related! If rain comes down on warm areas such as pavement (which holds heat), the water will warm up. The warm water will then run off into a stream, increasing the temperature of the stream, as well as diluting it. So, our possible explanation is that there was heavy rainfall on November 19, but we didn’t collect any information about rainfall. Fortunately, there are lots of other groups who collect data, and we could look up data about rainfall from somewhere like NOAA’s Climate Data Tool to see if there is evidence to support our explanation. 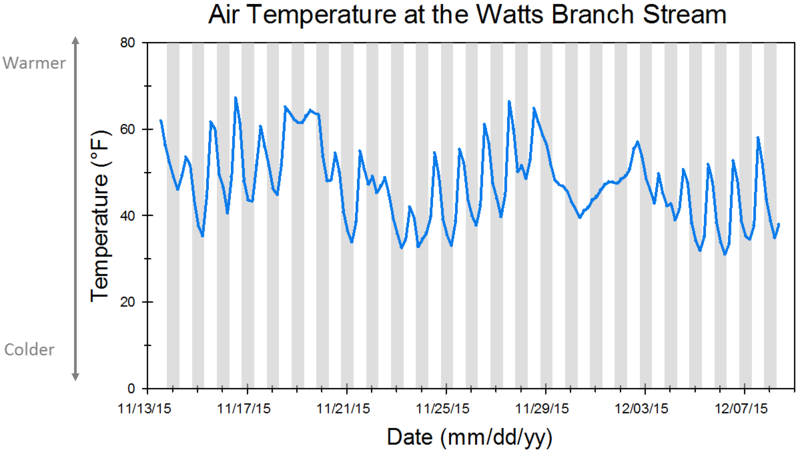 By checking the rainfall data, we can see that indeed, it did rain on November 19, 2015 in the area of Washington DC around Watts Branch. Let’s look and see if there is any evidence of the November 19th rain event in the air temperature data. We can test this explanation, too. In this graph, we’ve shaded the hours when it was dark outside, so that grey areas are data points that were collected during the night and white areas are data points that were collected during the day time. We can see that the temperatures drop at night and rise during the day, which explains the peaks and valleys that we see. So, based on our data, we proposed some explanations for the patterns that we see. We think that a rain event caused an increase in water temperature and a decrease in salinity, but did not have an impact on air temperature. Instead, we see a daily cycle in the air temperature, with cooler air temperatures at night and warmer temperatures during the day. We can probably be pretty confident in our explanation of the daily cycle for the changes in air temperature because that is the pattern that we see repeated through the graph. We can’t be as confident about our hypothesis that rain events lead to lower salinity and higher water temperature because we only have one occurrence of this. To be more confident, we would need to have more data to see if the same odd occurrences occur with other rain events. We could also look at additional data sources, like the NOAA climate Data tool that we use to determine if it rained near Watts Branch on November 19, to see if there are times when there were rain events, but we don’t see changes in the salinity or water temperature. If we have changes in water temperature and salinity without a rain event or rain events that don’t cause changes in salinity and water temperature, we would become less confident in our explanation, and would likely need to come up with a new explanation or add some more details to our existing explanation. An example of more details might be something like, changes in salinity and water temperature are only seen if it rains at least 2 inches. This is the same basic explanation, but with more details about when that explanation may or may not apply. It is also important to consider whether or not our explanations make sense. It makes sense that rain would cause a decrease in salinity because we are adding more fresh water, so the stream is more diluted. It would also make sense that water that had come off of the warm land (especially in urban areas with lots of pavement) would heat up the stream, so we would see increased water temperature. And, we know that in general, air temperatures are warmer during the day than during the night, so our explanation for the pattern in the air temperature makes sense too. But, analyzing our data also leads to some more questions, which is great because doing science is all about asking good questions! So, why didn’t we see a change in the air temperature with the November 19 rain event like we saw changes in water temperature in salinity? We can use our data and some outside information to explore this further. 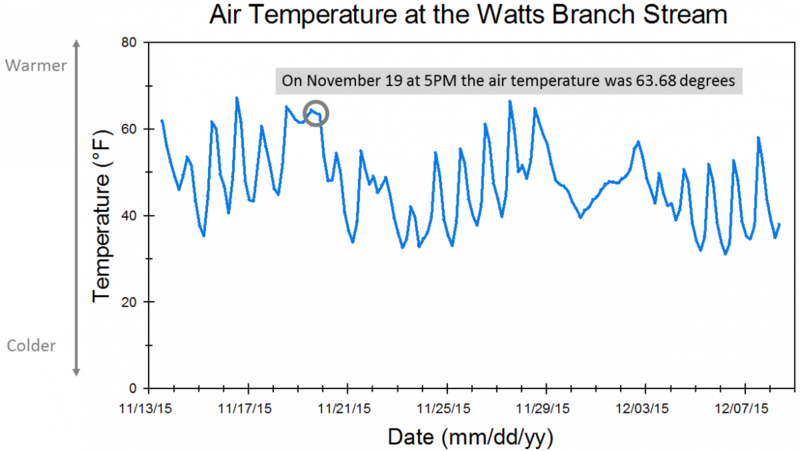 A good way to start exploring this question might be to look at air temperature and water temperature on the same graph. We can see that water temperature is more consistent than air temperature. We see a strong daily pattern in the air temperature, but we don’t really see that change in the water temperature. Over our study period, the air temperature ranged from 31.04 °F to 66.26 °F, but the water temperature had a much smaller range from 42.62 °F to 62.75 °F. That is a 53% change in air temperature, but only a 32% change in water temperature. Water temperature doesn’t change as quickly or easily as air temperature does, making it more stable. All of this means short-term temperature changes will be more obvious in the water temperature data than in the air temperature data because air temperature data bounces around so much that there would really need to be a change in order for us to notice it. On the other hand, the water temperature data is more stable (and less bouncy), so it is easier to see changes. This is another explanation that we can continue to test as we get more data. 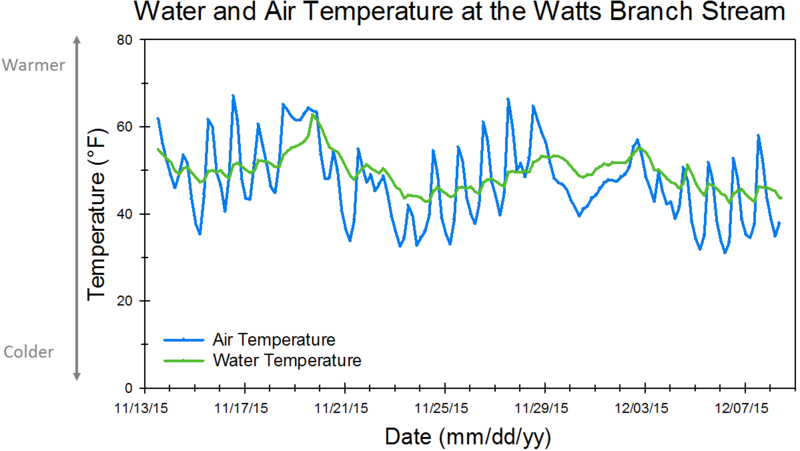 Looking at these two temperature data sets together also gives us more evidence to support the explanation that the increase in the water temperature on November 19th was caused by a rain event. Rain would cause an increase runoff from surrounding areas into this stream. Water hitting warm pavements and hard surfaces would travel into the stream, causing the temperature in the stream to go up. Adding fresh water to salty water dilutes the amount of salt, causing salinity in the stream to go down. When we look at our graph, we can see that the air temperature had been warmer than the water temperature before the rain event, but that the air and water temperatures were similar after the rain event. This makes sense if the rise in temperature in the stream was caused by adding water that was heated up from the land. Please check back as more data become available.